A natural complement to your Accounting fundamentals. 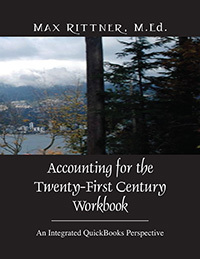 The Accounting for the Twenty-First Century Classroom Workbook will demonstrate to teachers and their students how it enhances QuickBooks as a useful and productive tool in developing the necessary Accounting skills for business students. This self-guided, prescriptive and tutorial-based resource will reinforce and complement the Accounting fundamentals required by Accounting students in their community college and high school. The book is an excellent resource for those first-time entrepreneurs starting their small business. Max Rittner has been an educator for over thirty years. He has a Masters Degree in Remedial Education-Remedial Mathematics (State University of New York). In Canada, he developed an Accounting and Business Education curriculum resource in association with Intuit Inc. The curriculum parallels recommended Accounting concepts taught at the secondary and community college level utilizing Intuit’s QuickBooks software. Since then, he has provided workshops and seminars at a variety of Business Educator conferences in Canada, United States of America and United Kingdom.